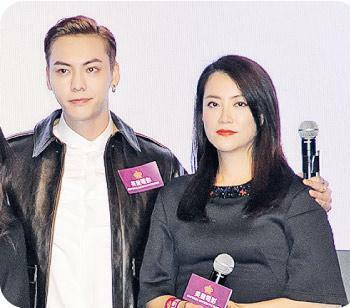 William Chan Wai Ting and former Girls' Generation member Jessica starred in the film I LOVE THE CRAZY LITTLE THING (NA GEIN FUNG KONG DIK SIU SI GIU OI CHING), which landed Nicholas Tse Ting Fung as its guest star. Chan Wai Ting thanked Ting Fung for his assistance despite being so busy, heading to Hawaii and working for a few days without rest or sleep. After the event ended, Chan Wai Ting will return to the Mainland to keep working on the film GENGHIS KHAN. He worked hard on gaining weight to play Genghis Khan and has already reached 150 pounds. He hoped to hit 170 pounds in two months. Now everyday he has 20 egg whites and no grease in his food, which made him very ill tempered.